Shame investors are too stupid to see how renewables are going to make lots of money. Only governments have that kind of vision, right? The financial disaster can be spun to “success” if we ignore the collapse in the EU industry and pretend that what matters is that other countries are picking up the futile baton. If China “overtakes” the EU we can use rose colored glasses and see a hyperbolic “turning point”. We can toss in graphs about increases in capacity which always make renewables sound good, because their theoretical fantasy capacity is so high. Cheap oil and gas couldn’t stop another record year for renewables, or a turning point for energy investment. The sun and the wind continue to defy gravity. Yet I read that the Labor PM, Turnbull, has just given $1 BILLION for renewables in Australia. That’s nearly as much as is wasted on the ABC ! Ouch! a double whack to the goolies, well played socialist Australia well played. So Europe has run out of other people’s money, how long until Australia does the same (to roughly quote Maggie Thatcher)? For starters, Turnbull didn’t give anyone any money, his creditors did. It is common for folk to say things like, “i purchased a house” when they didn’t at all a creditor/bank did. Secondly, there is this,,,,,,, what do renewables, military weapons, and the oil have in common? There is relatively little money in any of them. The real/big money is in the debt that these industries cause. Another good example amongst many is real estate. “Every year (the fund) will invest $100 million in the smartest, most cutting edge, Australian clean energy technologies and businesses,” Mr Turnbull said, flanked by Environment Minister Greg Hunt. Great! That goal implies building new Advanced Ultra-Super Critical steam coal-fired power stations which will be 20% more fuel-efficient than present operational boilers. That higher efficiency will cut CO2 emissions by the same fraction while delivering the same power 24h per day reliably and emitting virtually no genuine pollution from the legally-mandated exhaust scrubbers, making them the best value for money and smartest CO2 emission reduction strategy available. Smart would imply understanding whether the problem is real before leaping into expensive solutions. Smart would imply an examination of the reliability of climate science before spending another 10 billion dollars on projects that rely on predictions of global warming doom. Smart would imply funding an international research programme to gather the 30 years of high-resolution mid-troposphere humidity, temperature, and radiation data that is needed to scientifically test greenhouse warming models offered by both the establishment and skeptics. Smart would imply funding more research into natural processes driving climate so that we can understand whether global temperatures will actually go down during this century in spite of CO2 heating taking place. Smart would imply preparations for, and adaptation to, any future change in climate, whether warming or cooling, so any damage is mitigated regardless of whether we can control the climate. So of course none of the above will be done by Warmbull & Co.
“We will help plug this investment gap.” The Federal Government confirmed it will “target projects such as large-scale solar with storage, off-shore energy, biofuels and smart grids”. Targeted by artillery, perhaps? Biofuel production from crops competes with food crops for arable land and raises food prices. Biofuel from GM algae or bacteria does not compete with food but has still not proven economic to conduct, it’s a loss of money and therefore not sustainable, uh I mean ripe for “plugging the investment gap”. The “Off-shore energy” usually means offshore wind turbines, which will do much less harm to bird life by being far away from trees, but are typically more expensive to build and maintain offshore than on land, making their net loss, uh I mean “investment gap” even greater than usual. “Smart grid” is code for “demand management” which in turn is code for surrendering control of your major appliances to the power company who can then turn your air conditioner or hot water heater on or off whenever is appropriate to die Zielvorgabe für die nationalen Emissionen. Will Warmbull & Co actually force any of this wish list to be implemented, or is it a pre-election sweetener for green-tinted voters? Is the LNP targeting these projects for actual execution, or are they only targeted for buzzword compliance? The Paris Climate Treaty will open for signatures 30 days after Warmbull made this announcement. Is the Clean Energy Future bill uh I mean Clean Energy Innovation Fund going to be in service of, or a substitute for, an Australian ratification of the Paris Treaty? The problem with the LNP right now is that you have absolutely no way of knowing until 22 April 2017. Now tell me that there’s no future in coal fired power. On that page alone are (at least) three of the giants of the electrical power generating industry. If there was no future in coal, do you seriously think they would be investing their money in R&D like this. I suspect that they are just waiting for all this kerfuffle to just blow over, and then they are ready to go. And even if it takes a little longer in our already Developed Countries, those giants are already doing this in China and India, perfecting it for when our day arrives. Let those green urgers hug their trees. Pretty soon, they’ll be wanting their home comforts, very quietly brought to you by these guys and old king coal. It seems to me that as more power grids are loaded up with whimsical intermittent supply to the point of instability the gloss will have to come off renewables. The added costs of accomodating huge surges and the futility of running make-up power in the background is senseless. If we could build dams to supply water and store power in a manner that is proportional to our population, there could be some hope to make something of these expensive schemes. Failing that, I see our best bet to maintain our productivity and survivability lays with baseload nuclear and coal. Both South Australia and Tasmania have recently shown the truth of this. Neither State is out of the toilet yet, nowhere near it. I am not up with the current figures, but my impression is that New Zealand gets the vast majority of its power from hydro, and does it several times by having multiple dams on the same river. And of course, the lakes formed behind the dams are great tourist attractions for those folks who just love burning fossil fuels, whilst towing their mates around on a piece of string. And then there are all of the hospitality and service sector jobs created by the constant stream of tourists. Not only that, but the outflows from the dams can be regulated and redirected to serve the needs of the vinyards, in their efforts to create the perfect Pinot Noir, that I just happen to have in a glass in front of me, as I type. And just think folks, the operational raw material for all this, is essentially free. Coal actually supplies the majority of it. NZ’s coal mines cannot really supply all that is needed, and in fact some of the thermal output from the South Island is of such high quality that it is more economic to export it and import lower quality Indonesian coal for the domestic shortfall. I’m told that in WW1, the high quality thermal coal from the open cut mine north of Westport had been used by design in the British warships as it gave superior heat for weight to push the steam engines then in use. One such British warship was in a tropical harbour when a hurricane blew up. Several German warships had anchored off the harbour waiting the storm out with the obvious plan of sinking the British ship when the storm lifted. The British captain decided to power out of the harbour through the storm, relying on the high quality coal powering his ship. The German ships had to watch helplessly as the British ship steamed out past them, but the story goes that the Germans applauded as the British powered past through the storm. And yes, coal quality characteristics are the hero here together with the engineering skill to use those qualities properly. Coal truly is a miracle fuel. Very little of NZ’s electricity generation comes from coal. The Huntley Power stations have been partly closed and Genesis (the company that owns them) says the remaining 2 will close by Dec 2018. There are a number of relatively small gas fired plants but Rereke is correct in saying the majority comes from hydro–over 65%. The quality coal you mention from the S Island west coast is now very limited because the company that mined and exported it went “belly up” –the irony is that a major cause of its problems was that in ventured into renewable energy projects. The price of coal dropping obviously did not help much. According to that great authority, Wikipedia, New Zealand Hydro has a capacity of 5.5GW, with fossil fuels providing 2.3GW, and Geothermal 1.1GW. The largest wind farm, Tararua produces a piddling 161MW, with West Wind coming second with 142MW, and we are supposedly one of the windiest countries in the world. we are supposedly one of the windiest countries in the world. Now that’s not fair, Rereke. You blokes have Winston Peters on your team. We blokes don’t necessarily agree that we have Winston on our team, that is up to the individual. Winston however, assumes that we blokes are always on his team, and so he feels that he can speak for the rest of us. And let’s never forget that the more ‘renewable green’ energy you have, the bigger your back up fossil fuelled power systems have to be, when the sun don’t shine and the wind don’t blow. Add that to the instability caused to power distribution systems by significant amounts of ‘renewable green’ energy production and you start to have a real problem. Germany and the UK being obvious cases in point. Note: The UK will imminently be facing a truly gargantuan energy crisis, yet by mid this year there will be no real power stations under construction anywhere in the country! Slowly but surely, the huge financial and political cost of ecoloon approved energy policies is beginning to be more widely realised. Woe betide a western government who chooses to pay ever increasing energy subsidies to greedy fat cat individuals and companies, while cutting back on expenditure on health and education – I wish!!! The Brits deserve all they get, let them sink into the slime-bog of dark green ecolunacy! The sun always shines and the wind always blows. It’s in several peer reviewed papers. On what basis do they make the claim that the costs of renewables is “plummeting”? The individual costs for solar panels and windmills might have gone down but they still remain many times mire expensive per unit of power produced than fossil, hydro or nuclear and you still need those traditional power genetators to back hp the “renewables” so overall it is an incredibly expensive exercise. Compare that with the figure I posted here the other day of a proposed thorium reactor of the LFTR design. Over one year it would use one tonne of thorium costing US$300,000 to produce 1000MW continuously for one year. Of course, you would have the cost of a reactor on top of that but still dirt cheap electricity. How’s that shorting hedge fund going, Jo? The Rockefeller Family Fund is divesting from fossil fuels as quickly as possible and ‘eliminate holdings’ of Exxon Mobil Corporation. Although they apparently have little fossil fuel investments left it looks like climate grandstanding in an attempt to renew the interest in so called renewables, poor buggers must be doing it tough ATM. “The Rockefeller Family Fund provided financial support to InsideClimate News and Columbia University Journalism School, which produced inaccurate and deliberately misleading stories about Exxon Mobil’s history of climate research,” Mr Jeffers added. How on earth Exxon scientists were expected to know CAGW was a settled science before the IPCC and it’s thousands of backers could even make it’s mind up is beyond me. The world has gone mad … it’s as crazy as the “scientists” calling for RICO charges against sceptics. Sanity is caught between misplaced authority and appeal to false authority, there’s no reasoning with administration when the patients have the keys to the asylum. That is an uncharacteristically sane comment from you Yonnie. Are you feeling alright? Quite fine thank you, I made that one up all by myself I did. it believes the threat of climate change is clear and warrants action. How on earth did they get that idea? Why on earth don’t they hit back with a bit of realism! They’re just paying lip service in an attempt to keep the CAGW myth in the public psyche for another green scheme. Got to admire their front though, these people could sell sh$t personalities to parking inspectors. Hooray! Renewable energy isn’t doing well! (apparently) And we celebrate this why, exactly, Jo? It’s renewable, right. Wouldn’t you hope it does well? What’s your agenda here, Jo? Say hello to the IPA for me. I’m lamenting the wasted funds. You’d prefer we wasted more? Yep, last reports, wind turbines last only 10 or so years.. then they need to be renewed.. more wasted money. You sort of beat me to this wind turbine life factor, Andy. I was going to write it up last night but was to darn tired. The date of my birth is becoming an increasing problem. I suspect that the European renewable energy industry has a somewhat worse outlook in its immediate future than most of us down here are aware of. A couple of the new major factors are of course, the Daesh promoted terror campaign in Europe which already is leading to very large economic resources being now directed into internal security plus a major increase in the European wide counter terrorism forces. That leaves a lot less economic resources available to be allocated to non essentials such as Renewable Energy, a factor that is now getting increasing recognition within Europe. An economic fact already evident as the Renewable Energy subsidies are being already being dramatically cut in the Spain, [ The Spanish equivalent of the High Court has ruled that the government is quite legitimate in cutting renewable energy subsidies despite any contracts written under different circumstances by past governments ] the UK, Ireland, Denmark, across Scandinavia and elsewhere in Europe and now becoming evident in some states of the USA. A second factor slowly being recognised is the more and more obvious and abject failure of Renewable Energy to deliver the amounts of power it promised plus the total failure after three decades or more of massive subsidies to begin reducing the costs of the renewable energy that was initially promised by the Renewable Energy industry if they were subsidised enough to reach a full development stage. Thirty or more years later nothing has been seen in renewable energy cost reduction to then ordinary power consumer and in fact the opposite appears to be the situation re the consumer, consumer energy prices have continued to increase to finance the subsidies to the Renewable energy industry. A third factor is the rising public anger and the increasing backlash outside of the political and green NGO renewable energy promoting symbiosis particularly in Germany at both the increasingly unaffordable cost and the prices of renewable generated energy and its utter lack of reliability and predictability. And inside of Germany the locals are about fed up with the arrogance of the turbine industry and the way in which it is just destroying so much of the Germany’s forests and picturesque rural countryside which Germany in the past has invested huge resources into preserving for future generations. Plus a steadily dawning realisation that turbine Infra sound, now being heavily researched in western Europe has and is causing severe health and mental problems to a good percentage of its citizens who have been afflicted with turbines being built in their in close proximity. The latest demand from a proffessional that is deeply involved in researching turbine generate Infra sound impacts on human health is demanding that any turbines installed in the future should be located at least five [5 ] kilometres away from the nearest habitation. A fourth factor is the rapidly increasing backlash from nations that border on the renewable energy poster child of Germany . Nations such as Poland, France, Czech, Dutch , Belgium are finding a rapid increase in blackouts and power outages as the German wind turbines rapidly increase output when wind velocities rapidly increase and the German grid system which is itself incapable of handling these turbine generated surges in power and cannot handle the extra load then dump the over supply of German turbine generated power across the borders into the neighbours grids which then fail and collapse under the unexpected and unpredicted surge in unwanted German power. So Germany’s neighbours are all installing Phase Shifting switches at their grid borders to stop the unwanted and grid system overloads from the German turbine surges in wind power so as to protect their own grid systems. In reference to AndyG55′s post above, from a 2012 study by Proff. Gordon Hughes on behalf of the UK’s Renewable Energy Foundation including the economic life of Wind turbines which is much shorter than any wind farm investors are ever informed of. There are a number of very informative graphs included in this study but to quote on the economic life of both UK and the Danish land based and off shore turbines. 1. Onshore wind turbines represent a relatively mature technology, which ought to have achieved a satisfactory level of reliability in operation as plants age. Unfortunately, detailed analysis of the relationship between age and performance gives a rather different picture for both the United Kingdom and Denmark with a significant decline in the average load factor of onshore wind farms adjusted for wind availability as they get older. appear to be a contributory factor. So taken all up and as the money runs out for the subsidies and the public becomes more and more aware of the total failure of the renewable energy industry to provide a reliable power supply [ and after a good dose of blackouts and brownouts ie; Tasmania ? ], there is a good chance that any wind farms still operating past 2020 will probably be abandoned when they run out of economic life and the tax payer or the locals will be left with the job and hideous expense of cleaning up after the wind turbine owners / operators have grabbed the money and cut and run. The answer to that of course is to force all Wind turbine and solar panel owner and operators into depositing a few million dollars per generating unit into a clean up fund and site rehabilitation which is no more than the mine owners and power generator owners and operators are now required to do across Australia. Plus making turbine owners legally liable for any wind turbine infrasound effects on local resident’s physical and mental health. Ross, you have a great point. We should be propping up a non-income producing, inefficient technology with tax payer funded subsidies. What we should do is get all those other primary industries together… you know the mining ones, the ones that pay tax, pay dividends, issue fully franked shares (they are the shares the companies have already paid another tax on), the companies that support hundreds of thousands of workers through wages and training schemes, the companies that provide sources of efficient and economical energy to keep other businesses profitable that in turn employ people and pay taxes. If we close all the efficient income producing businesses that pay tax, and they in turn can no longer employ workers who pay tax, who in turn can no longer support all the other businesses who pay tax, where do you propose the tax payer funds for you uneconomical and inefficient renewable schemes will come from? It is a waste of your time arguing with people like Ross. They believe there is a an endless supply from the big bag of money that the Government uses, and all you have to do is squeal loudly and some will come your way. So many of the people who believe this are employed (one way or another) by the Government, either directly as public servants or in the health and education sector, or the recipients of benefits such as the unemployed, disabled, consultants and commissions, and builders of renewable energy flops. In most western democracies that now adds up to 50% of the voters, so changing this is close to impossible. See the reaction recently in Greece, Spain, Portugal and Canada with left wingers gaining support through promises of more government spending. I have come to the conclusion that only a prolonged economic depression will reverse this idea, and it may take generations. In the meantime the Chinese, Indian and southern African economies will boom. Eventually Europe will regain some prosperity from the flood of now affluent tourists wanting to see the remains of previous prosperous countries while they wonder how those europeans could have been so stupid as to lose the plot. For Australia we will have to rely on kangaroos and koalas as any attempts to retrain our politicians for some useful purpose are doomed to failure. No, Graeme, I wasn’t arguing with Ross, I was agreeing with him, but the more I supported his point the more stupid his point seemed. Wishing renewables could carry base load and reduce human induced CO2 emissions is a forlorn hope. CO2 doesn’t actually cause global warming, the hiatus proves that, so it would be far more productive if we spent the billions helping the Third World climb out of poverty. Clean drinking water for all would be a nice start. It’s a real-time measurement of subsidies paid to wind industry in Finland by the state of Finland, each day, each second. What’s interesting is that it seems that the more the wind blows, the more it costs. Silly me, that’s what it’s all about. Not only is it a great idea, but it should become mandatory, as should the disclosure of the amount of green energy subsidies in every electricity bill. As for the Finnish Website, which discloses that these subsidies cost an average of 4.32 Euros per second, that doesn’t sound much until you realise that’s 136 million Euros per year. I firmly believe with that sort of money we could have found a cure for most if not all cancers. What a disgusting waste of money. It’s almost criminal. Thanks. I had the same thought in my mind as you but I was in one of those moments of weakness. The trouble though is people like Turnbull are so delusional their moment of weakness as exhibited lately is like comparing a nuclear explosion with a soap bubble bursting. If you’re a doubter on climate change, take notice. Not only is that work “not there yet,” there doesn’t seem to be a particular sense of urgency to get there. Warren Buffett has already answered that. He own a big insurance company. The way Buffett sees it the more the payouts the bigger the insurance industry becomes, so no need for shareholders to panic. Indeed they should rejoice if calamities become commonplace. And if that doesn’t pay enough, Berkshire Hathaway’s investments in rail oil/coal/produce haulage company will make up the difference. According to BB&T, the real key that convinced the analyst that things are turning around in transport is JB Hunt’s relationship to its “largest intermodal partner,” BNSF. BNSF, as you probably know, is now the rail transport arm of Warren Buffett’s Berkshire Hathaway (NYSE:BRK-B). And according to BB&T, business is going gangbusters at this Berkshire Hathaway subsidiary. renewable investments there will be a stampede to the exits . Shorting them before they go broke is the surest way to make money from these pretenders . I understand where you’re comming from but I’m just not sure about the merit in shorting government interference or stupidity. Governments can’t even get stupidity right, because it has to be formulated into a sequence of procedural steps, in the various Departmental Operating Instructions. A lot of people have invested their superannation (non Aussies => retirement savings) in so-called ethical investment funds and these invest a lot in “renewable” energy. Down the track there are going to be some very upset investors who lose their life savings. Or some very broke governments trying to prop it up. Probably both. Whenever you see the words “clean” or “green” coupled with “energy” or “power”, keep a tight grip on your wallet. If it’s ‘clean’, ‘green’ and ‘sustainable’ lock your pocketbook somewhere safe, preferable in a different country. Who’d have thought it story. •HELE coal-fired power generation mitigates more CO2 emissions than renewables per dollar of investment. •By 2040, 1.1 billion tonnes of CO2 per year could be avoided by deploying HELE technologies. •Given the higher capital costs of renewable technologies and their lower load factors, in most regions, conversion to HELE technologies represents the lowest cost CO2 abatement alternative. It’s disturbing that even the World Coal Association seems to believe that CO2 is bad and go along with this. Efficient burning of coal is good for purely economic reasons, nothing else. A business that openly demonises it’s own product? Hmmm a very strange coalescing of strategy indeed. I think the coal power producers see CO2 as a by-product rather than a product. Using high efficiency systems REDUCES the CO2 emissions per power output. But the planet needs MORE ATMOSPHERIC CO2.. not less !! Huh! Who would have thought! I don’t know how many times I have said that the best and easiest way to reduce Australia’s CO2 emissions would be to update ALL coal fired power to the most modern designs. WAKE UP PEOPLE…. Solar and wind almost certainly INCREASE global CO2 emissions. Modernising COAL fired power stations would be far more effective, and would only increase the reliability of the energy supply systems. Renewables just finished another record-breaking year, with more money invested ($329 billion) and more capacity added (121 gigawatts) than ever before…..
121GigaWatts, and hey wouldn’t that fire up the DeLorean? You know, power delivery the equivalent of 10 USC (HELE) coal fired power plants. That’s ten plants with 2 X 1300MW generators, which will cost (and here I’m quoting the steep end of costs) around $40 Billion. The Flux Capacitor required 1.21 gigawatts of power travelling at 88 mph to work, that’s 100 DeLorean’s worth, with about 6,500 still existing the future is looking good /sarc. If 10 DeLorean’s could take us back to nip all this nonsense in the bud it might just be worth it. Talcum buys into a slush fund. Yeah I caught that earlier, with an election coming up a little reinforcing seems appropriate. For all of you who normally vote Liberal, might be best to spoil your ballot. Any idea how many thorium fired nuclear power plants could be built with 1/3rd of a trillion dollars (including R&D)? Same question for the small modular nuclear reactors? And how many birds have been slaughtered and other wildlife? Ask a few pertinent questions. Funnily enough I have just written a magazine article on thorium reactors including small versions. Here are some 2008 figures for small modular reactors (uranium). 24 Mar: MIT Technology Review: Richard Martin: Ivanpah’s Problems Could Signal the End of Concentrated Solar in the U.S. But the troubles at Ivanpah have joined the delay or cancellation of several high-profile projects as evidence that concentrated solar power could be a dying technology. I wonder why they are having problems. How could industries based on selling stuff costing $125, $145 or $275 have trouble competing with people selling at $30 ? Perhaps they need a carbon tax or ETS to help? We have seen Spain blow big money on Solar. We have seen California blow big money on solar. We, in Australia, are really going to show them how to blow big money. We will repeat their mistakes over and over. Innovation I think???? Continuity with change???? There has never been a more exciting time to be Malcolm Turnbull!!!!!! Concentrating Solar Power (CSP) was hyped to be the coming thing, but all along it was a flop, and the hype never lived up to expectations, no matter what they tried to spin. Although CSP has been part of what I’ve been doing for 8 years now, I singled out what was happening in Spain back in November of 2013 at the Post at the following link. 24 of these CSP plants, and not one of them delivering power anywhere even close to what could be considered acceptable. See the table at the link for data on every one of those 24 plants. That of itself should have been a signal that it was never going to be of any worth. Imagine if that money had have been spent on something that gave value for money, instead of this immense waste. Unreliable CSP at $275 per MWh v reliable coal at $30 – what would a Turnbull choose? Right now, Good Friday, 11.00AM, with virtually every workplace and commercial outlet in the Country closed down for the Easter holiday, total power consumption is probably at its lowest here in Australia in comparison with most working days. Because of that, one unit at Bayswater is off line, probably still running, but just not delivering power. So now, Bayswater only has 3 units delivering power, so three quarters delivery from ONE power plant. That’s a (currently right now) Nameplate of 1860MW, and that’s the actual total from the site which details power delivery from every power plant East of the WA border. So, and I know it’s still the cooler Months in the Northern Hemisphere, but pretend it’s mid Summer there in Spain, and these CSP plants are all working at their best. That’s 24 of these CSP plants covering an area of 55 square Kilometres in all, just the plants themselves. Just those three units at Bayswater provide 100MW (Nameplate) more than all 24 of these Spanish CSP plants. Under average yearly operation, those 24 Spanish solar plants will deliver across a whole 12 month year the same power delivered by Bayswater in 93 days. Pretend in your wildest dream that these 24 Spanish solar plants will actually last for the proposed 25 years. The total power generated by ALL of them for that 25 years will have been delivered by Bayswater in 6 years and 5 Months. Bayswater has been open for 30 years, so it has already delivered 4.6 times the power that might be delivered from every one of these Spanish plants if they last their full life span, and Bayswater has perhaps 20 years still to run. All totally useless FACTS, because CSP is the way of the future ….. so they say! OT – I want to congratulate the JAFA’s an other NZlanders for not choosing the “white feather of surrender” for their flag. I look forward to the UK getting out of the EU. If I could not live in the US, I would choose NZ. It is the biggest scam in history. It hurts the poor the most. It is a transfer of wealth from the poor and middle class to the upper classes and the government class. “Whatever you do, don’t graph renewables output in actual megawatts. Don’t graph it in CO2 tons saved. And most misleadingly, never show the extreme climate that has been stopped by renewables, even though this is the reason they are built. If you can predict more extreme weather in 100 years if they aren’t built, the same logic demands you can show the extreme weather stopped so far by these ugly blights on the pristine landscape. Meanwhile, where are all the “green jobs”? Port Augusta is the fabled canary in the coalmine – a coal town teetering on a precipice as it transitions away from fossil fuels. “The closure of Alinta’s coal operations in the area are frankly devastating,” says Joseph Scales, secretary of the Australian Services Union, which represents most of the workers at the Northern power station, set to be shut down in May this year. When it closes, almost 200 people will lose their jobs. You mean they haven’t built the solar power to replace the coal? The green jobs are in the unemployment que. The ‘unemployed’ do not have enough money to create CO2 and in fact, it is possible to graph CO2 production from economic data alone. Don’t worry, there are plenty of people who do not understand the theory of economic relativity. E = MCO2 2 Or Economic activity equals Money (Fiat currency) Carbon Dioxide squared. * E = MCO2 2 Or, Economic activity equals Money (Fiat currency) Carbon Dioxide squared. When an entire country loses nearly all its jobs, like Greece recently, then that country is Carbon Green. The CO2 emissions from the average Greek is nearly zero, when a few olive trees here and there are included in my special theory of economic relativity that i explain in some detail using the formula above. 200 jobs gone, maybe 45-50 jobs created, intermittent power supply … it’s a Whyalla Wipeout! “SolarReserve has built a 110MW solar thermal plant in the desert in Nevada, with more than 10,000 mirrors concentrating the sun’s heat on to a tower filled with molten salt. It’s building a similar plant now in South Africa and hopes to do something roughly the same in Port Augusta. “In Nevada, our Crescent Dunes project created roughly 4,000 jobs ,” he says. “We had more than 1,000 people on site at one time building it. From similar plants we can set the cost at $275 per MWh or $150 more than solar PV (or at least $230 more than the shut down coal fired) so an excess payout or just over $45 million which will have to be paid by SA consumers in higher electricity bills. If we take a more realistic average rate of 340 MWh per day (2) and assume also this happens every day then the excess over PV solar amounts to $18 million per year. If we paid the 200 soon to be unemployed $75,000 a year we would ‘save’ money, and boost the economy of Port Augusta. (1) For those fooled into thinking they run at night, this can only be done by reducing output during the day and storing the excess heat for use at night, or for the sun to shine at night. (2) Ivanpah – “the largest CSP plant in the World – runs about 45% capacity ignoring the output from natural gas heating used in the morning to heat the ‘molten’ salt. So now instead of 98% of CO2 coming from overseas, it is now 98.001%? How are the people of South Australia better off? Less guilt? These closures defy logic, especially in a state which is now critically dependent on CO2 power from Victoria, as shown by the 5 hour statewide blackout in November when the feed from Victoria broke. The same in Green Tasmania, except they cannot find the break. Must be those giant King Island crayfish with a taste for power. Is one called Malcolm? How does the Green jobs bit work in a Solar generator anyway? Sorry, 45 jobs created. Maintenance? Oiling moving bits like sunrays presumably. Watching stuff, like the sun go up and down. Sounds rewarding stuff. Washing all those mirrors with squeegees on 4metre poles every 2 days. How do you replace jobs like this with Green jobs. The CFMEU is going to start rolling strikes at Hazelwood and elsewhere to support their claims for $180,000 pa for a 4 day week, $150 a month for mobile phones and to be paid to walk to and from the carpark. Presumably at overtime rates. Who needs a degree? I do not think Australia can afford Green people with squeegees in the desert on night shift. Corrupt CFMEU union thugs and left leaning governments will make sure there are plenty of green “jobs” just like they did at the VIC desal plant. This reminds me of the late 1980′s when I read regularly in the network trade press that “soon” the installed base of token-ring networks would overtake that of ethernet. Over the course of several years the discrepancy between token ring and ethernet kept getting bigger but IBM had the money and kept the trade rags supplied with copy. The so-called journalists at those trade rags kept pushing the same line month after month, seemingly unaware that last month’s rosy projection had just been falsified by the updated numbers in this month’s rosy projection. Will the Twistcow take the tasty green bait and photo op? The Queensland Government has called on the Prime Minister to visit parts of the Great Barrier Reef which are dead or dying from coral bleaching. “I have no doubt that if [Mr Turnbull] could see these reefs first hand, he would step up and he would deliver for Australia a decent plan to address climate change, as well as additional support for our efforts,” Qld State Environment Minister Steven Miles said. Forget just viewing the video supplied, nothing says “committed” like a first-hand fossil-fuelled flight over the fossil-fuelled ‘global’ warming. …and this weekend the ABC has a thingy on the GBR hosted by a celebrity naturalist. Coincidence? “An Australian Sustainable Development Commission, with authority, adequate funding and broad support, would send a very clear signal domestically and internationally that we are serious about implementing the SDGs and the Paris agreement. You have to wonder about the ‘renewables’ from China boosting global Green energy. Who checks that stuff and what does it matter if coal fired power is growing at a vastly greater rate anyway? It is as if ‘renewables’ are an end in themselves, which is true for the renewables industry, wind and solar. So who is the biggest supplier in these industries? The same Chinese government. It was always a puzzle that the Pyramid building industry in Egypt lasted only 200 years. Amazing things, building up to three at the same time and then nothing. It looks like our wind and solar farms will join Stonehenge, the Egyptian pyramids, the Mexican pyramids, Easter Island statues and the structures of paleolithic Turkey in history. Future generations can only marvel at things which were the product of a forgotten and irrational religion which became an enormous and fundamentally pointless industry. compare what Jo wrote to the BBC spin! Global investment in renewable energy hit a record US$285.9bn (£202.3bn) in 2015, beating the previous high of $278.5bn set in 2011, a study shows. The 10th Global Trends in Renewable Energy Investment also showed that investment in developing nations exceeded that in developed countries. In another first, more new renewables capacity than fossil-fuel generation came online during 2015. “A large element in this turnaround was China, which lifted its investment by 17% to US$102.9bn, or 36% of the world total,” the report observed. However, other developing nations also contributed as six of the top 10 investors were developing nations. Lead author Angus McCrone, chief editor at Bloomberg New Energy Finance: “One advantage that renewables has is that it can be built very quickly,” he explained. “If you are a power-hungry emerging market in Africa or South America, for instance, you can put up a wind farm in six to nine months, or a solar plant in three to six months. Glenn Jones, a professor of marine sciences, and Kevin Warner, a doctoral candidate in marine biology, argue that to keep the temperature from ever breaking that two-degree threshold, 50 percent of the world’s energy will have to come from renewable sources by 2028. According to the International Energy Agency, renewable energy accounted for 22 percent of the world’s energy in 2013 and is expected to be at 26 percent in 2020. Jones said he doesn’t see how the world could ramp up renewables as much as it needs to in that short a time period. He used the example of wind turbine production, which he said is one of many facets of renewable energy that would need to be vastly increased. He said the equivalent of 13,000 5-megawatt wind turbines were installed around the world in 2015. That number would have to average 485,000 5-megawatt wind turbines a year globally by 2028. You have to love the way China is still a developing nation, with the world’s second highest GDP. We’ve reached “peak clean energy”… who’d ‘a thunk it! Has anyone thought of how to dispose of all the windmills when they fail in a few years? Blades are not recyclable and give off toxics if burned. Steel towers are highly recyclable, as with copper wiring. I assume the rare earth magnets might be reprocessable into new magnets. Hundreds or thousands of tonnes of concrete foundation – will they dig it up or leave it in the ground? Concrete can be recycled but I think it is a marginal proposition and most windmills are in remote areas so transport would be uneconomic. “What can be done with the decommissioned wind turbines? “A previous study that was commissioned by Scottish National Heritage (SNH) forecasted that there would be a need to ‘recycle’ “approximately 225,000 tons of rotor blades by the year 2034. Something similar is happening in Germany, where the rotor blades “are ‘reprocessed’ in industrial scale factories and then shredded and mixed with other waste. The final product is then used in “cement manufacturing facilities as fuel. There you go then Mike, it’s all ‘sustainable’ and therefore no problem. Ho-humm, I wonder how much energy it took to make the blades in the first place? Or is that the wrong question. Concrete breaks down after a few centuries or millennia, so that’s not a problem. There is plenty of Roman concrete around still in good condition. That was my understanding of the article about what happens to turbine blades when they are decommissioned. Well let’s settle on a few millennia rather than centuries. This is for the “resistance” design. The “weight” or gravity design use 305 cubic yards of concrete but is just 8.6 feet deep. The above source is located in central Washington State, USA. ELEANOR HALL: Australia’s leading medical funding body, the National Health and Medical Research Council (NH and MRC), has awarded $3.3 million to two researchers to investigate whether proximity to wind turbines makes people sick. That’s despite the NH and MRC previously finding that there was “no evidence” that exposure to wind farm noise causes illness. SIMON CHAPMAN (University of Sydney’s Emeritus Professor): There are people who are anxious and worried about all manner of extremely low or non-existent risks and agencies like the NHMRC don’t quarantine money for that. I mean they don’t put money aside for people who believe that UFOs are landing people and are going to infect us. I mean these sorts of issues have their adherence as well, but the NHMRC does of course not quarantine money for that. IMOGEN BRENNAN: The Prime Minister Malcolm Turnbull has defended the funding. MALCOLM TURNBULL: A reasonable exercise for the Government is to, as we have promised, has been promised last year, to investigate the matter and if the conclusion is as you suspect it will be that will serve to allay a lot of anxiety. And that’s a very important thing to do. The planning application has been refused, mainly because of the environmental impact. comment #32 on wind turbines is in moderation. The clock is ticking for SunEdison Inc. The world’s biggest clean-energy developer has already postponed the release of its 2015 annual report, twice. If SunEdison fails to file the report by March 30, it must reach accommodations with lenders on at least $1.4 billion in loans and credit facilities or face a potential technical default. 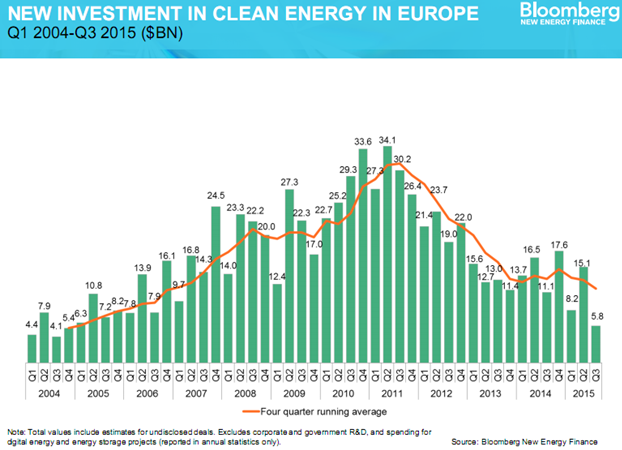 24 Mar: OilPrice: James Burgess: As SunEdison Tanks, Is Rest Of Solar Going With It? COAL-fired electricity production in Scotland will end this afternoon when Longannet power station in Fife switches off the last of its four generating units for the final time. It came on line in 1969 after taking eight years to build, and was the largest such unit in Europe. Longannet was originally designed to run for just 25 years and throughout its life it has powered on average over 2 million homes in every year of operation. (Energy Minister Fergus) Ewing blamed the UK Government, which he said needed an urgent review of its energy policy. He said: “The shambles of the Westminster Tories energy policy sees the premature closure of Longannet happen at the same time as warnings continue about the narrowing gap between electricity demand and supply. “With the closure of Longannet the margin of spare capacity will get even tighter, yet the Tories have put the brakes on the development of replacement capacity in Scotland, onshore and offshore wind power and the CCS project which would have resulted in increased low carbon thermal generation at Peterhead. The shambles of the Westminster Tories energy policy sees the premature closure of Longannet happen at the same time as warnings continue about the narrowing gap between electricity demand and supply. 47 years of operation, and they call this a ….. premature closure. Wind and solar power dream of lasting as long as this ancient old clunker. How stupid we humans be. Well, smart people are stupid for allowing themselves to be told what to do by stupid people. How much does it really cost to convert your home to solar power? A new study (LINK) estimates the average cost in California was $18,675 last year after typical incentives. Solar to the People Report: How Much do Solar Panels Cost in California? •California has the highest cost of energy on the West Coast, and one of the highest costs of energy in the country. If you look at Australia’s adventure in renewables, you’ll see the scam being partly funded by certificates that are magiced into existence by fiat when installers sign a piece of paper to state that some renewable energy technology has been installed. That technology is supposed to deliver 1 MWh (megawatt-hour) of electrical power equivalent over the lifetime of 15 years (for PV solar and solar thermal). The people who paid to have the systems installed can immediately claim a corresponding number of certificates which the company installing will gladly take care off their hands at the going rate; which is about 5 times the global trading rate; and convert that to a “rebate” to the punter. The installers have deals with traders who then sell the certificates to generators of derdy carbun electrical power because those producing reliable power are compelled by law to purchase unreliable power corresponding to a proportion of their generated power. Obviously a government-instigated system which permits people to take money from others ought to have checks, balances and auditability; especially to ensure that the quantity generated by the renewables for which the certificates are created, are producing electrical power accordingly. But the auditability stops at the paper trail; and paper is uncritical. There is no systematic measuring of electrical power actually generated by renewables. (An official, tamper-evident meter would add approximately $5 to the cost of an inverter.) There appears to be no inspection of installed systems to ensure that they are functioning as specified after the end of warranty; when the owner of the liability is perhaps confronted with a $4000 quote to replace an inverter. Many owners of such systems haven’t explicitly insured their PV systems. Not even as a major asset which they (theoretically) are obliged to keep operational for 15 years; even to replace (at full cost) if the system is destroyed by e.g. a house fire. There is no way to tell if what is promised and paid for will ever be delivered. And those forced to pay the price have no rights to be able to enjoy that for which they’re being forced to pay. Kings have been made to stand on a soggy island in a swamp until they agreed to accept to the property rights of free men. It’s laughable and optimism at it’s worst to think we can just plod along business as usual with solar panels and windmills. It’s a Greenwashing [snip]. Once you understand EROEI aka EROI the penny will drop with a loud thud. Nothing works with 7 Billion + people. Infinite growth with finite resources….a 10 year old could explain why this cannot work and will never work and yet our politicians still plod along telling us fairly tales about more growth and more jobs, hover boards and pots of gold at the end of the Rainbow. There is a pot but it’s full of something brown and smelly. Try reading the April 2016 article “Catching a Wave” in Smithonian.com. We are learning from something that happened a billion years ago.